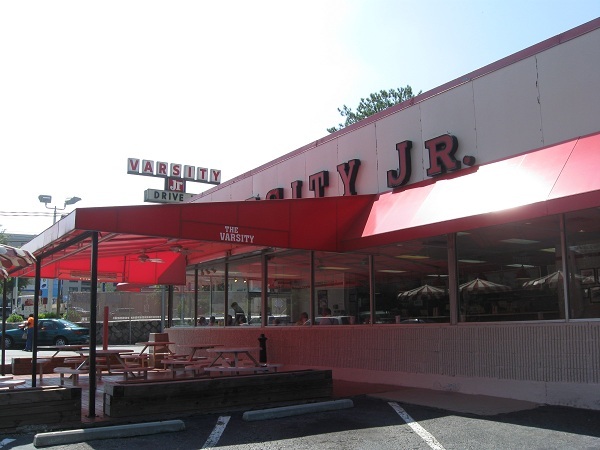 The Varsity Jr., Atlanta GA (CLOSED) – Marie, Let's Eat! I knew that at some point, Marie and I would have to use the blog to spread the unfortunate word about a much-loved restaurant closing, and write up an obituary tribute. I certainly never expected that I would be doing this about The Varsity Jr. on Lindbergh Drive and I’m still amazed that we’re saying goodbye to it before we had the chance to take the camera down to the main location on North Avenue for a proper entry on this Atlanta landmark. According to the restaurant, it’s a stupid problem with city politics that have doomed the landmark after forty-five years. In a letter to their customers (available as well on the restaurant’s website), the owners explain that the time was long past for an overhaul of the old building, but their architects could not come to an agreement with the city planners. The Atlanta Journal-Constitution reported that one sticking point was the number of driveways, of all things. This has almost coincided with the groundbreaking of a new Varsity up north in Dawsonville. Apart from the two inside the perimeter and one in Athens, there have long been suburban Varsities northward up all three arteries out of the city, in Norcross, Alpharetta and within walking distance of us in Kennerietta. There is also, incidentally, a really small mini-Varsity in Waleska on the campus of Reinhardt College. I thought that was top secret city lore, but somebody blabbed it onto Wikipedia. Anyway, so the Varsity Jr. is effectively moving to Dawsonville, leaving behind a lot of history and memories. Almost exactly twenty years ago, Atlanta was suffering a heat wave that would make the current one seem like an autumn breeze. I was driving around my circuit of record stores that August in my second car, a giant, two-door Oldsmobile Delta 88 without air conditioning. 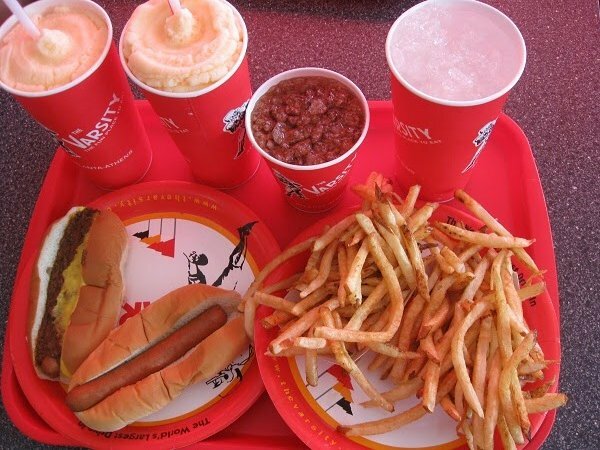 I felt like I was about to pass out from the heat, and I stopped into the Varsity Jr. to cool off. I haven’t thought about this in years, and my present-day self is a little sheepishly embarrassed by how silly I was acting at age eighteen, but I remember that I ordered two small Varsity Oranges – not the better known “F.O.” Frosted Orange, but their tasty not-very-carbonated drink – and a large cup of ice water. I sat in the dining room and slowly drank one of the orange sodas and then took the other drinks outside into the hundred-and-seven degree heat. I took a deep breath, lifted the water cup above my head and slowly poured that out over me. I’m sure that it felt very good at the time. I was an ostentatious kid. I have lots of silly memories about the place. Many of them seem to have a little sadness around the edges. When my son was just a few weeks old, he decided to go live at Scottish Rite for a month with supraventricular tachycardia. His mother and I subsided on hospital food for several days before I ventured out to get something tasty. I brought back two boxes from Varsity Jr. and stood in an elevator with about six other sad-eyed parents and visitors and grease running up both my sleeves. “Boy, that smells good,” one of them said. By the time we reached the intensive care floor, I was lucky to escape with all my food. I also remember something really unhappy. The Varsity Jr.’s location was absolutely perfect for a quick walk before or after a movie at the Tara Theater across the street. About five years ago, I took a young lady to see Howl’s Moving Castle. We were on our way to the restaurant for a late dinner afterwards and she started spinning a yarn about an ex-boyfriend that she claimed was stalking her. The subsequent conversation, after we got our food, about the constant danger she felt turned out to be both a gigantic warning sign and a great big old lie that still actively aggravates me. There’s not been a meal here since that I didn’t feel the desire to stand in front of that booth, reach backwards in time and punch myself in the jaw. On Saturday, Marie and the kids and I had an early lunch here to say goodbye. Between us, we had three burgers with pimento cheese and four dogs, two with slaw, one with chili and one naked. We had two orders of fries, one order of rings, two FOs and one small Coke. Only a mild case of indigestion and artery-clogging followed. We’ll have to get to the main location again before too much longer and write that up. Heaven knows I direct enough tourists that direction every week; I’m rather overdue. But Cheshire Bridge and Lindbergh without a Varsity is just crazy talk. Where are we supposed to eat after seeing a movie at the Tara now? Posted on August 9, 2010 July 29, 2017 by Grant G.Posted in atlanta, burgers, georgia, goodbye, hot dogs, regional chainsTagged atlanta, burgers, cheshire bridge, closed!, drive-ins, fast food, georgia, hot dogs, pimento cheese, regional chains. Pingback: Big D’s BBQ, Dawsonville GA – Marie, Let's Eat!